Daniel A. Benkendorf grew up in Sussex County and attended High Point Regional High School. He obtained his undergraduate degree at Bloomsburg University, in Bloomsburg, Pennsylvania in 2007. While at Bloomsburg, Mr. Benkendorf majored in communication studies with a focus on leadership and social influence, and he minored in legal studies. Mr. Benkendorf obtained his J.D. 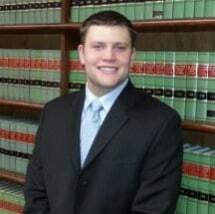 from Thomas M. Cooley Law School, in Lansing, Michigan, in 2010 and has been a member of the New Jersey Bar since 2011. Mr. Benkendorf worked as a judicial law clerk from 2011 to 2012 under the guidance of the Honorable James A. Farber, J.S.C. in the Superior Court of New Jersey, Chancery Division, Family Part. While working as a law clerk, Mr. Benkendorf was the judicial liaison for the Sussex County, High School Mock-Trial Competition. Before coming to Heymann & Fletcher, Mr. Benkendorf was an associate with the law firm of Morris Downing & Sherred, LLP from 2012 to 2013, where he practiced litigation focusing on family law matters.